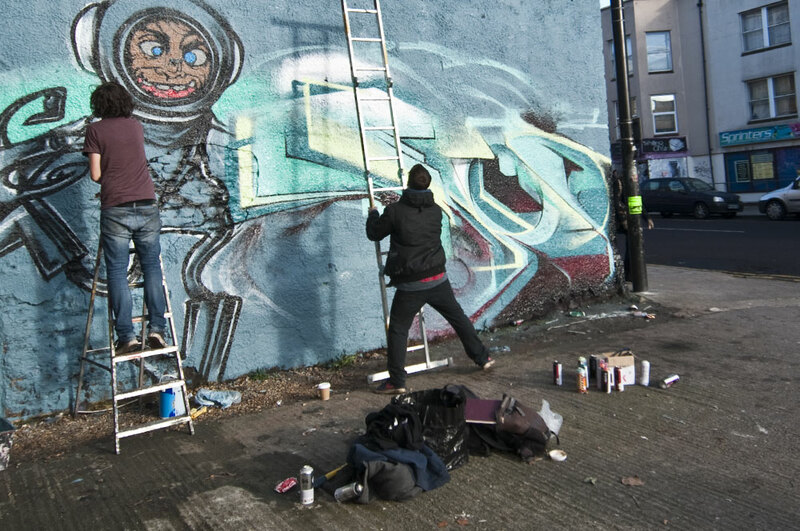 Author Felix 'FLX' Braun, talks to us about the release of the second edition of his mighty Bristol graffiti bible, 'Children Of The Can'. 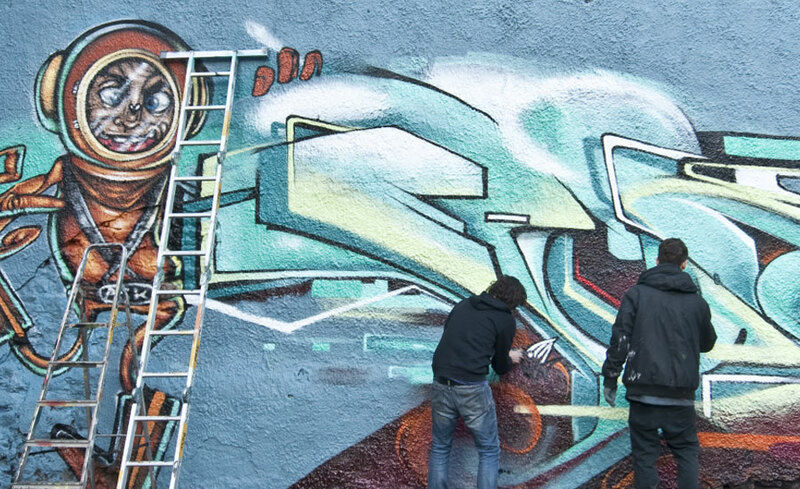 A mini street jam, in association with HangFire and Tangent Books, was held in the Stocks Croft area of Bristol to help celebrate the launch of this new, updated edition. For those who are not familiar with FLX's work, where have you been? The man has been around since Bristol's graffiti golden age of the mid eighties, painting in the legendary graffiti clique 'CIC' (Crime Inc Crew) alongside INKIE, JINX and Nick Walker. 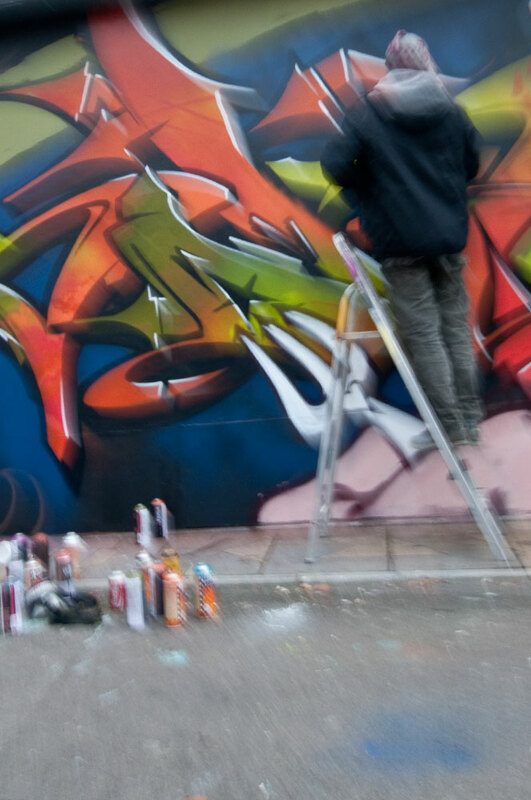 The countless graffiti youth workshops and teaching and fund raising events that FLX has organised are outstanding - in 2011 FLX took part in a 24hr Paint-A-Thon at Bristol's King Of Paint HQ, raising money for in aid of TEMWA's Malawi campaign. This was a remarkable show of will, character and self motivation. We managed to catch up with Felix, the loose leaf tea lover! - Felix, how are you man? - I'm alright, thanks. Just made a cup of tea and stuck my slippers on to get nice and relaxed for this interview. You can't beat real leaf tea. I've gone right off tea bags. I bought it by mistake, and I'm never going back. - Good, good. I agree with that, nothing more refreshing than a cup of tea, brewed correctly. So whats happening with the re-release of the book, how did this come about? - It's not often you get a chance to re-think a major project like this, but I've been able to do exactly that. I sat down with Richard Jones (Tangent Books' big cheese) and graphic designer Joe Burt, and we went through the first edition, picking the whole thing to piece; everything from "I don't like the body copy font, and the point size is too big" to "can we have 64 extra pages, please? " It was a very rewarding exercise, as there was so much about the first one that I felt needed changing, and Rich and Joe agreed with about most of it. I am an obsessive perfectionist, so I think they were very brave to give me so much control over every aspect of the rethink. - What can we expect from the new version? - Things change quickly in graffiti and street art, and 4 years is a really long time; a lot has happened in Bristol since the first book and we wanted to cover all of it! It's got a new subtitle (Bristol Graffiti And Street Art) and is no longer arranged chronologically. We've changed to an alphabetised arrangement, which vastly switches up the look of the whole thing: we still start with 3D, but he's followed 3Dom, which is a completely new chapter, full of up-to-the-minute flicks and a brand new interview. 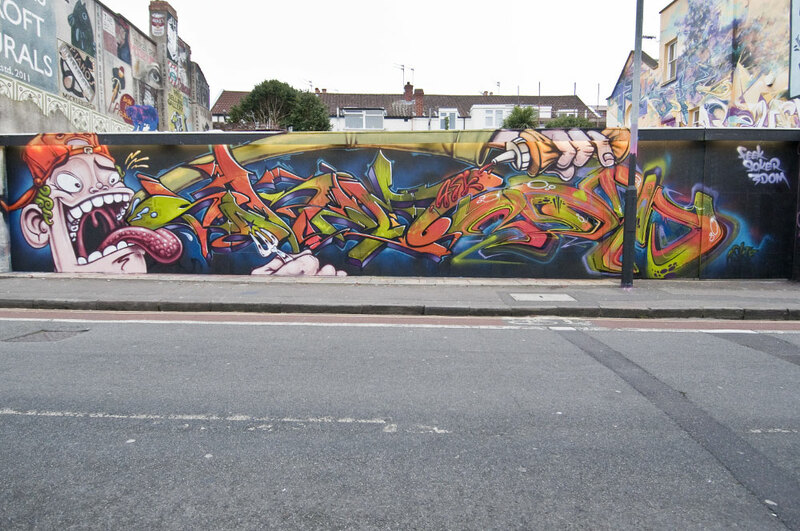 Loads more artists are featured, and all the original ones have added new photos – either of new work, or previously unseen old flicks – and there are more non-artist focussed sections, such as photos of tags/hand styles and dubs/throw ups. There is even a section about the graffiti police! (*HF cough*) A lot of the chapters are unrecognisable from the first edition; given the opportunity most people wanted to exchange pretty much ALL their original photos for new ones. The designer was pretty much at the end of his tether by the time we went to print. - Ah this sounds cool man, can't wait to see it. Sorry for my interruption also - i think i choked on my Tea! So, what are the main challenges you had to overcome when remixing for the 2nd edition? - I'm not sure where to start? Time-management is my biggest issue, and my girlfriend hated me sitting up in bed on my laptop at night. It's a bit of a passion killer! Getting all the material together; writing up the new chapters; working from transcriptions of audio interviews with broad, mumbling Bristolians, that had been transcribed by a middle-aged housewife was a total nightmare! I overcame them, though, by being stubborn, determined, and having a very understanding family! I'm still not sure how I managed to write the first one, it was an insane project. Updating it was hard enough, God only knows how I did it the first time; I was a very different person to the one who started writing it, by the time I'd finished, I know that much. The high point was definitely seeing the design starting to come together, especially how amazing some of the really big photos look. My main bug-bear with the first one was that it didn't manage to capture that moment of walking down the street and turning a corner to see a brand new burner that had been painted the night before. That moment of surprise and awe, that adrenaline rush of being smacked in the eyes by a beautiful new piece! A two-inch square photo of a fifteen foot long piece is a travesty, in my opinion. I want to study the details close-up, work out how it was done, see the splats; and that's what we've tried to do with the big photos; which I feel are necessary to match the detail people have gone into in talking about their work. - It seems as though a lot of thought and consideration has gone into the new release, that's nice to hear. How have you managed to live a 'normal' life whilst putting in this amount of effort, what has your last 6 months looked like, apart from the obvious? - A project like this can take over your life, especially if you have the kind of obsessive nature that I have; but aside from working day and night to get the book finished, I've painted a handful of walls; and set up a commercial graff murals company, called The Paintsmiths, with Dones, which is slowly starting to take off (Paintsmiths). I've kind of become a recluse, to be honest. You can't manage all the stuff I have one with a hangover! Well, I can't, I'm much too old to go up a ladder to paint in the rain if I'm not feeling 100%. - Putting Children Of The Can loosely to one side for now, but if you had the opportunity to write another book, what would it be? - I'd love to write an international graffiti book, go around the world interviewing people, photographing their work, getting under the skin of fellow graffiti writers on the other side of the globe. Obviously I'd have to paint while I'm there! I feel like the canon of graff and street art literature is bit lacking in real, proper, art criticism; and by that i don't mean criticising people's work, I mean it in the sense of analysis and discussion of aesthetics and trends within the movement. It's such a huge and powerful visual force, globally, that it really needs some proper examining. There are some good books out there, but nowhere near enough! I'd also like to write a novel, maybe a collection of short stories first? I've got some ideas flying around in head, maybe a graff thriller? I don't think it's been done. My pet project is a book of drawing games for kids, ones I've invented over the last ten years of working in education. Some are graffiti-focussed, but most aren't. It's kind of a teaching resource, but also for parents. It's nowhere near finished and only really exists in my head at the moment, although I'm trying out the games week-in week-out, in the schools and PRUs (Pupil Referral Unit) that I work in. - I'm more than positive that a few of these goals will be achieved sometime in the future. When you write, do you have any literacy heavyweights that influence you? - The Dalai Lama is pretty special, his writing is really lucid, even when he's talking about very hard to understand concepts in Buddhism. I love David Mitchell's books (the author, not the comedian), especially 'Ghostwritten'. Gabriel Garcia Marquez was a masterful story teller, as well. Will Eisner's work is incredible, he wrote the book on how to tell stories with sequential drawings, in my opinion; Moebius is another favourite in that field. Graffiti-wise: the Futura 2000 book he co-wrote with Mo'Wax some years ago is excellent, a kind of visual autobiography; 'Fuzz One' by Vincent Fedorchak is a brilliant autobiographical romp through the early New York subway writing scene. - Touching on the New York wonder years and Hip Hop slightly; How do you think graffiti has changed over the last few decades, with regards to its initial movement and purpose? 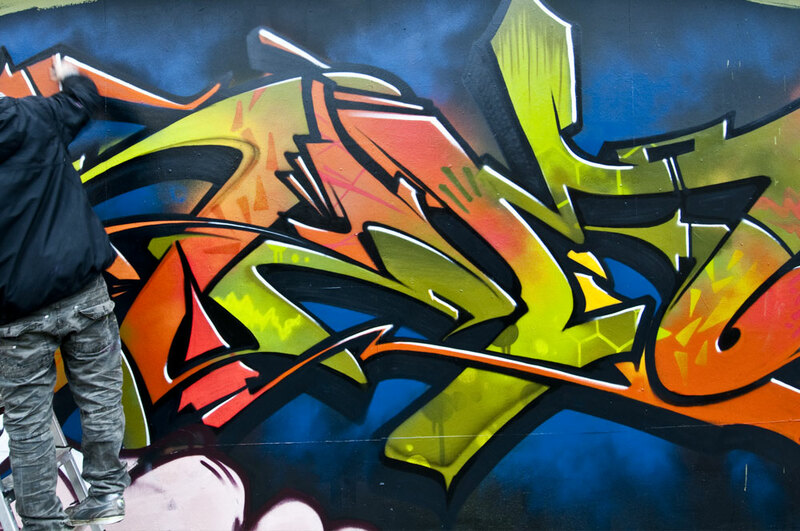 - I think perhaps the main difference, apart from the obvious technical advancements, over the last few decades, is that graffiti is not exclusively part of the hip hop subculture anymore, and exists entirely in its own right. Obviously a lot of writers still acknowledge the link in their pieces, but there’s a lot more to it as well. Graffiti predated the start of hip hop by some years, anyway, and really got tied to it by the early media coverage in New York. Initially it just so happened that some of the writers were b-boys as well, and went to the jams to break, or had brothers who were deejays or whatever; but hip hop only became a single subculture when it got labeled as such. It has gradually outgrown hip hop again, and evolved in ways that have nothing to do with it anymore, and I think that’s very much for the best. 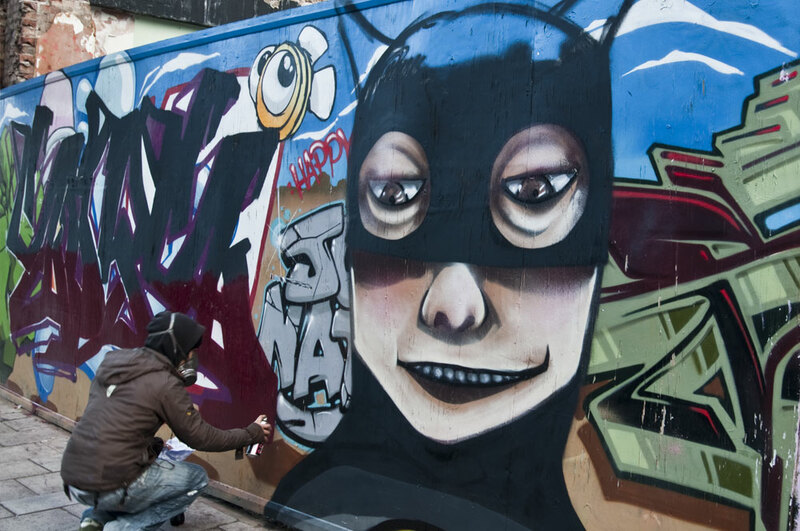 Like hip hop, graffiti has also become a commercial phenomenon over the years. When we started out we never would have dreamed of some of the things that have happened, some of them good, some of them bad. I have very mixed feelings about graffiti getting used in advertising, for example, or by Bristol City Council to promote the city as ‘edgy’. But it happens to every youth movement, in one way or another. I think the key is to make sure that you retain control of your own work and are proactive in harnessing what you do professionally, if that’s where you want to take it, as a graffiti writer, musician, or whatever. 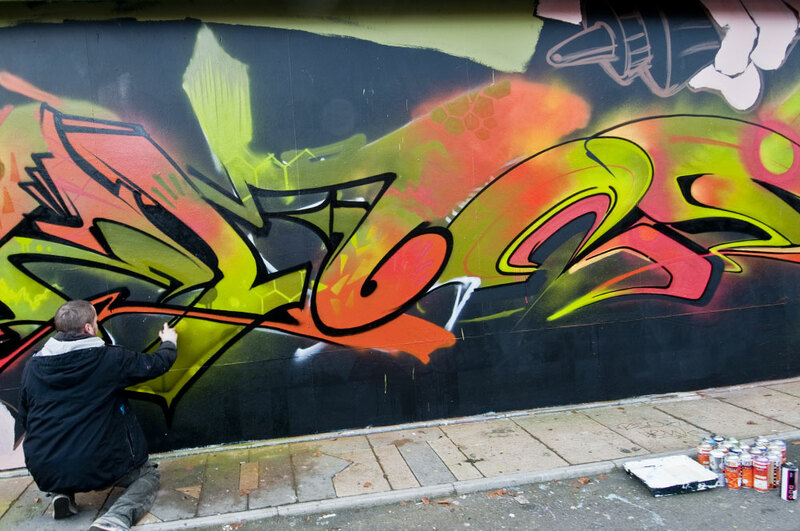 - As with most Graffiti artists, Hip Hop must have influenced you as you grew, did you take on any of the other elements? 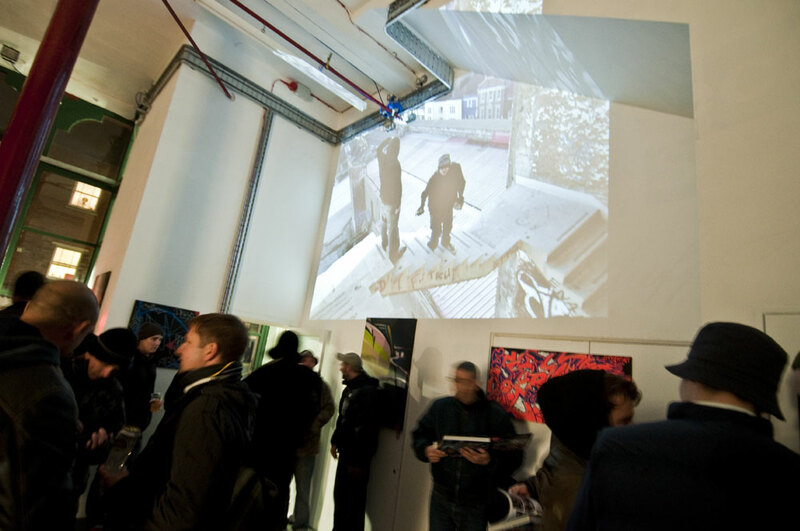 - I started painting in the 80s, so hip hop was still new to the UK, and underground clubs like the Dug Out and Tropics, and the house party scene, made for a very rich musical environment in Bristol. Practically everybody I knew was involved in one way or another. I had a go at MCing for a while, and used to rock the mic for a local soundsystem called FBI Crew (Funky Beats Inc), but I was never very good; anyone who heard me, or - heaven forbid - has a tape of one of our jams would attest to that, I'm sure. FBI were really good, they had some amazing music. I was the weak link in the chain, but they got some good flyers and posters into the bargain. Later on I got into collecting records and beat making, which evolved into a small independent production outfit and record label (Kongcrete Records) with Paul Cleaves from FBI, and a couple of other guys. I only stopped deejaying about a year ago; my hearing was beginning to suffer! - oh no man, i didn't relise. I've been present at a few of your sets, always a nice playlist. So who are your musical influences? - Too many to mention. I grew up with music, my mum and dad both had good record collections, so I was exposed to a multitude of diverse sounds from very early on: from The Beatles and The Stones, through to classical, jazz, opera, soul. My earliest musical memory is of knowing what Miles Davis' Kinda Blue sounded like, just from looking at the cover. It was very blue and I remember getting that the music sounded blue too. So when hip hop came along, and then the rare groove scene took off, I already had a taste for musical exploration, which continues to this day. - As with all types of creativeness, whether its music or art, the real-ness seems to come from a struggle, a need or want for self expression. 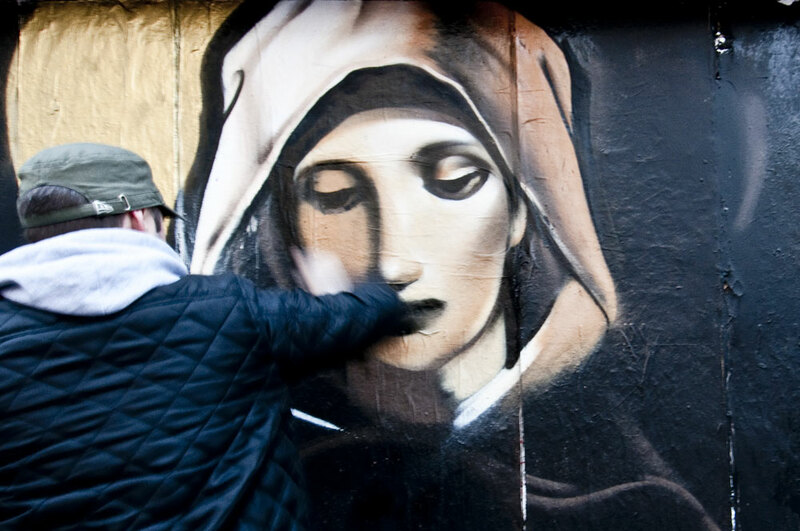 Do you feel the graffiti movement has become a little too convenient and now lacks a kind of rawness? - It’s a lifestyle you can buy into, for sure; but look, if you’re going out bombing at night, that’s never going to become easy; in fact these days you’re much more likely to get caught, than back when I was out every Saturday night painting with my crew. We got sloppy, that’s the only reason we got caught. The fact that there are more legal spots is great, it allows for development of style, and for people to hook up and paint in a relaxed way. With all the inherent risks involved these days, illegal painting has necessarily become increasingly slap-dash; so legal spots are really the only opportunity writers have to do anything of artistic merit. And I think that’s extremely important. - Bristol is definitley strong in nurturing top local graffiti heads, and it's adoption of 'outsiders', why do you think this is? - It’s an interesting point. I’d say that the acceptance of graffiti in Bristol has turned it into a magnet for burgeoning talent, which in turn means the scene grows, and attracts more people, and so on. This in turn raises the city’s profile nationally and internationally. A lot of very successful and influential writers have come out of Bristol, or called this place home at some point, and the list increases year on year. 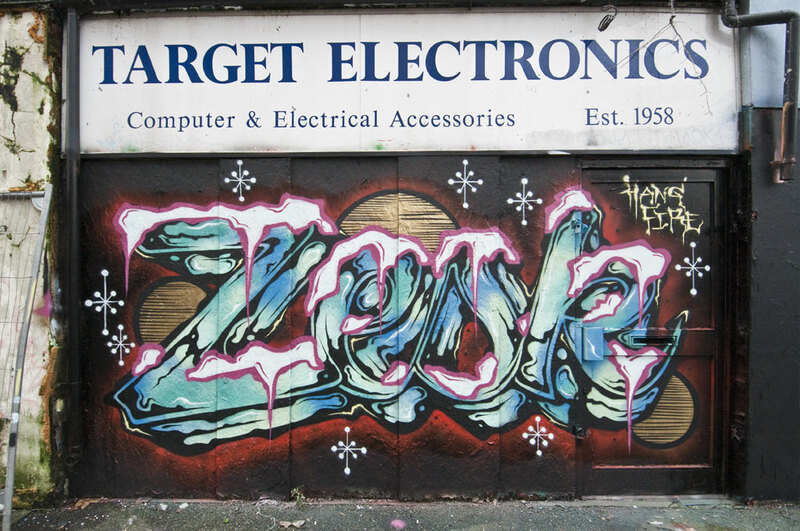 - Can you remember the first piece of graffiti you saw in the city? - That’s a tricky one, it would have been one of the early 3D and/or The Z-Boys pieces in Clifton, but I don’t exactly remember which one. The buzz of seeing something new in those days was amazing, though; without really having any idea how it had been done, or anything, our responses were always a mixture of excitement and bewilderment, I think. - Dope! Not a trace of graffiti exists up there now, or for long...Clifton Smifton! 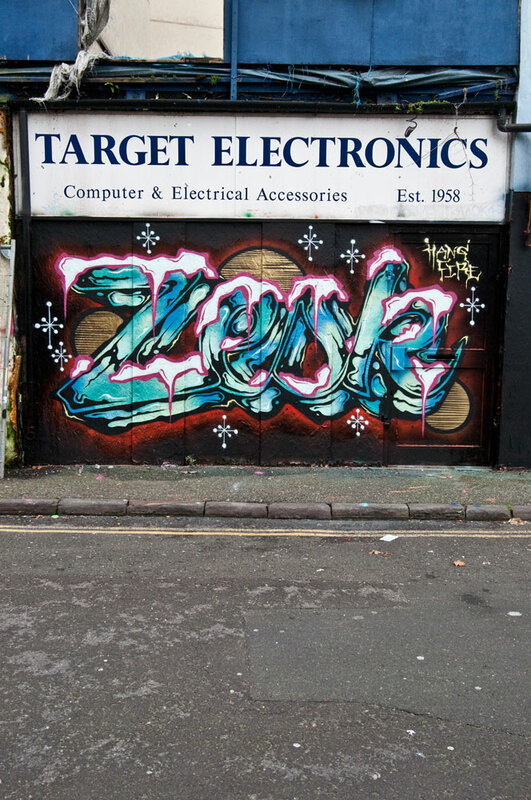 So we had a little graffiti jam in Stokes Croft, celebrating the release of the 2nd edition but can you remember your first graffit jam? - I remember being very nervous painting next to CHEO at Southside Freestyle, in 1989. His character was so much better than what I was painting that I got really freaked out and made a right mess of it. When I spoke to him about this a few years back, he responded by saying how good he thought my characters were at the time, and how had felt very similar! - haha, that's a nice thing. Do you have any humorous graffiti related stories? - I don’t know about humorous, but the time INKIE and I got caught was pretty memorable. We were painting a spot we had painted once before, on the side wall of a garage, after spending most of the evening at a friends getting totally wrecked and having a party, basically. By the time we got to the wall we had about ten people in tow, as ‘look outs’. In reality they just stood around smoking, drinking and talking loudly, and completely failed to notice the police until they were right on top of us; at which point everyone scarpered, and INKIE and I tried to hide behind one of the cars on the garage forecourt. The police cornered us, and started jeering “look at these two, what are you up to? Breaking in? Or a bit of gay action, is it?” or words to that effect. As teenagers we were mortified by the latter suggestion, so made it clear that we were in fact painting graffiti, by pointing at it, but the police still couldn’t see it, even though they were looking right at the wall! Then INKIE tried to make a run for it, at which point one of the police wrestled him to the floor, and trod on his throat. It was pretty nasty. - Well that was quite funny, until the cops got all ruff. I think we'll start to wrap up man, time for you to make a new pot of Tea. But can you just give the readers a little insight into your influences as a kid? - My mum was (and still is) a very good artist, so she was my first and biggest influence, and we always had loads of art around the house, and would get dragged around exhibitions and museums, so I’m sure all that sunk in. We had magazine cuttings of paintings by the old masters, covering the walls in the toilet upstairs in our house, which used to terrify me; Jacques-Louis David's painting of Marat/Sade dead in the bath had an especially profound effect on me! Then yeah, all the usual stuff: Marvel superhero comics; underground comics, like The Fabulous Freak Brothers, Metal Hurlant; Asterix, Lucky Luke and Tintin; cartoons like Marine Boy, Battle Of The Planets, Hong Kong Phooey, Inch High Private Eye, The Hair Bear Bunch, Top Cat. I had some good art teachers, but the experience was pretty tame compared to the visual stimuli I was experiencing at home. - Thats nice man, kids and adults always need a positive influences in their life. How do you see the graffiti movement evolve over the next 30 year? - Graffiti is like the Wombles, it comes overground then goes back underground, reacting to itself, and reinventing itself. I don’t see this cycle ever changing, and that’s important, because it keeps things frrrrresh. - Lets hope so - keep teaching the babies. You are laying it out for them in your book, i hope they still relate to this in the future. So where can the kids (and adults alike) pick up a copy of the new edition? - So, any final words or shout outs? - All the Bristol artists and writers involved in the book, Bristol's a strong city for graff and street art, and hopefully I've managed to capture that in the book; all the photographers who have contributed the images that bring my writing to life; all at Tangent, Joe Burt, for doing a sterling job of re-designing this beast . - Nice work, thanks for your time. I know you've been real busy, thanks for your time. Peace. "Then INKIE tried to make a run for it, at which point one of the police wrestled him to the floor, and trod on his throat. It was pretty nasty." "Graffiti is like the Wombles, it comes overground then goes back underground, reacting to itself, and reinventing itself." "It’s a lifestyle you can buy into, for sure; but look, if you’re going out bombing at night, that’s never going to become easy; in fact these days you’re much more likely to get caught, than back when I was out every Saturday night painting with my crew." Contributing artists: JODY, SOKER, ZESK, FOIS, EPOK, SEPR, FEEK, 3DOM, HAKA, XENZ, EKO, INKIE, SILENT HOBO, HEMPER, TES, DEVAS, SORSE, SHIMZ.